His favourite playtime activity is building forts or vehicles with furniture--mostly the loveseat cushions & his little wooden chairs. Linnaeus still loves watching Mighty Machines & Busytown (particularly the one about the submarine). For a few days after I filled the aquarium & got it running, he would look to see if there were any fish each time he came into the kitchen. It took me a while to realized he thought they would spontaneously appear. He plays with his sister a lot, but still struggles with explaining what he wants her to do. Often this results in a squabble, as she's not particularly compliant when he tries to make her sit in his imaginary firetruck/boat/rocket ship. Linnaeus is always making up songs, frequently to the tune of Metallica's Iron Man. As his language skills grow, the little kidisms disappear slowly. "Owligator" is long gone, but there are still a few left, which I can sum up in a sentence: "The elly-ins got into their spaceship & they're going to plast off!" He's definitely developed my chocoholism & will eat anything that has chocolate in it. Pretty sure Linnaeus hasn't gained any weight in the past six months, but he's steadily getting taller, growing out of his pants & long-sleeved shirts, but only in length. Though he's currently got a chest cold, his cough hasn't turned croupy. It's been a while since he's had that barking cough, so I think he's grown out of it. 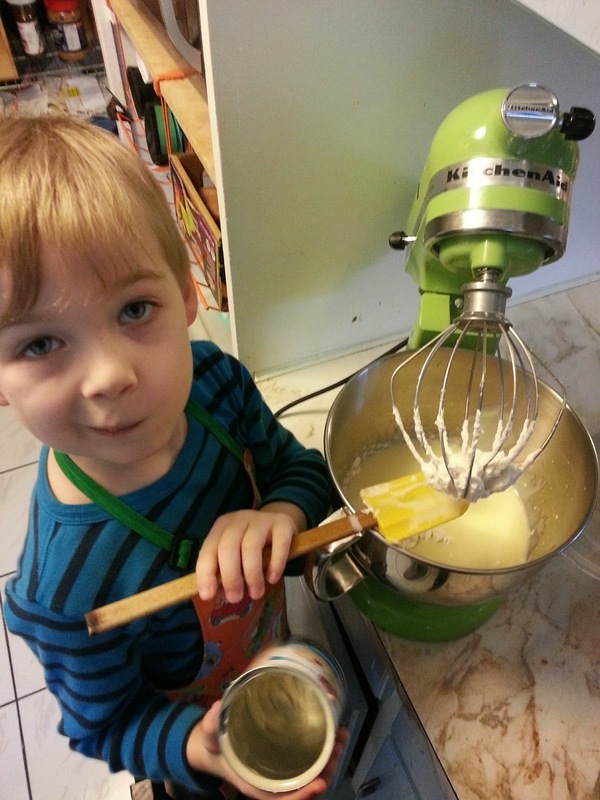 Linnaeus loves to help me bake, especially when I use the mixer. We tried making two ingredient ice cream recently & he helped out.